Dry eye disease is multifactorial in aetiology and complex in pathophysiology that makes its diagnosis clinically challenging. 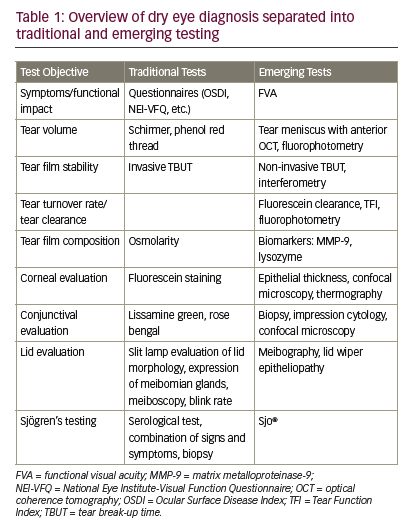 Although there are numerous tools for assessment of dry eye disease, no single test is sufficient for the diagnosis. Typically a combination of subjective symptoms and objective tests are used. The aim of this article is to review the available tests, including traditional tools and emerging technologies. This review will include a description of the test methodology, type of data collected, diagnostic reliability of data, benefits and limitations of each test, expected outcomes and tips for practical application. Sarah Dougherty Wood and Shahzad I Mian do not have financial or proprietary interest in any materials or methods mentioned. No funding was received in the publication of this article. The International Dry Eye Workshop Dry Eye Workshop (DEWS) defined dry eye as “a multifactorial disease of the tears and ocular surface that results in symptoms of discomfort, visual disturbance and tear film instability with potential damage of the ocular surface. It is accompanied by increased osmolarity of the tear film and inflammation of the ocular surface”.1 This condition is divided into two general types: deficient aqueous production by the lacrimal gland and increased evaporation of the tear film, with the latter being more prevalent. It is also common for patients to exhibit a combination of both types of dry eye disease. Despite the seemingly clear definition of the disease, the diagnosis presents many challenges to the practitioner. First, no gold standard protocol for diagnosis exists2 and no one test is sufficient for diagnosis due to poor reliability for many common tests, multiple causative components of the disease and lack of well-defined cut-off values to distinguish disease from normal.2 To further complicate the diagnosis, the signs and symptoms do not always correlate and both can vary based on influences, such as diurnal or seasonal fluctuations.3 In addition, many of the tests are invasive in nature and this may influence the outcome. Lastly, other conditions can mimic dry eye such as ocular allergy. 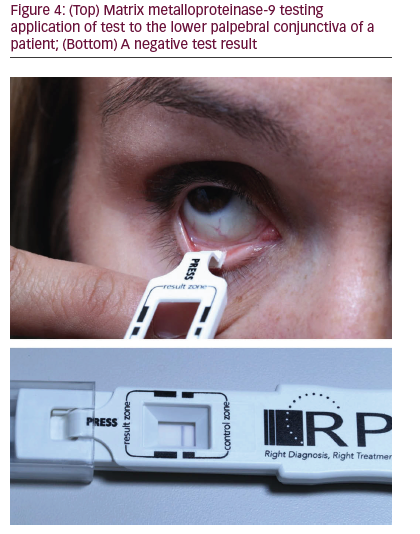 Due to these challenges, alternatives to traditional dry eye testing have emerged. The purpose of this article is to describe the traditional and emerging tests for diagnosis that are clinically useful, including the benefits and limitations and practical pearls. Table 1 lists both the traditional and emerging tests categorised by test objective. Subjective symptoms and their quality of life impact are a critical component of dry eye evaluation. The clinical signs and symptoms do not always correlate and the patients’ experience of their condition is ultimately the most important measure and will cause them to seek treatment. Symptom questionnaires are one of the most repeatable of the dry eye diagnostic tests4 and allow for diagnosis screening, assessment of treatment efficacy and grading of disease severity. Symptom questionnaires are also a critical part of dry eye clinical research trials. The Ocular Surface Disease Index (OSDI) is commonly used, validated and includes 12 questions related to experience during the previous week regarding ocular symptoms, the severity, how these affect visual function and the ocular response to environmental triggers. The score can range from 0–100 with a higher score being worse. 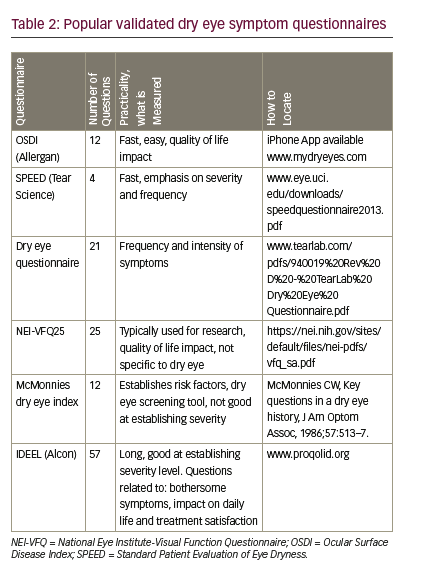 A score of 15 has moderate sensitivity and specificity, 60% and 83%, respectively, for the diagnosis of dry eye disease.5 The Standard Patient Evaluation of Eye Dryness (SPEED) questionnaire helps identify symptoms and focuses on their severity and frequency.6 Table 2 provides a summary of popular questionnaires including links to obtain the questionnaires for use. • Symptom questionnaires should be used in combination with objective findings to aid in diagnosis. • These questionnaires can easily be given by a trained technician. • This test should be performed after conjunctival and corneal stain tests because the testing strip may disrupt these surfaces and alter their accuracy. • Avoid punctal plugs as a treatment for dry eye in patients with test results above 10. They have a higher risk of excessive tearing as a result. give a falsely low result. The non-invasive TBUT (NI-TBUT) test will be discussed later in this article. • The results are dose dependent with higher volume of fluorescein causing a falsely high result. To minimise variability, consider wetting the strip with a single drop of saline and then shake off excess fluid with a quick flick. A micropipette can be used but this is generally not practical clinically. Osmolarity testing measures the concentration of solutes in the tear film where higher levels indicate a reduced aqueous component, either by increased evaporation or reduced aqueous secretion. Unfortunately, this objective test does not distinguish the type of dry eye. Increased osmolarity is a critical component of dry eye disease pathology. 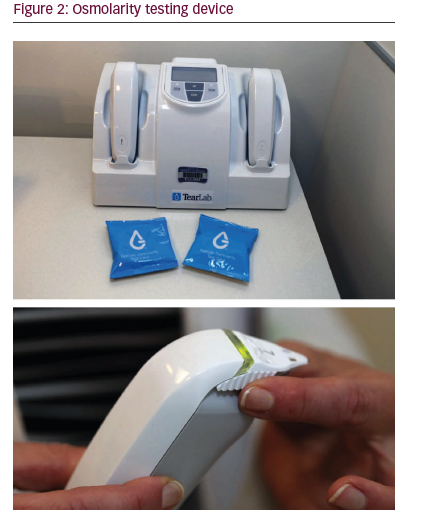 The TearLab test (TearLab Inc., San Diego, CA, US) is easy and readily available for use in clinic. It is performed by obtaining 50 nanolitres of tears, applied to an assay, and the results are available immediately in clinic (see Figure 2). The cut-off for normal is 308 mOsm/L or less.10 This test is excellent for severe dry eye disease diagnosis but poor for mild disease. In addition to diagnosis, osmolarity testing can serve as a longitudinal measure to follow the effectiveness of treatment. Normal tears will lack variability with repeated measures,11 but dry eye can be inconsistent, which is likely reflective of the nature of the disease. The test results can also be affected by non-ocular factors such as systemic medications and environmental conditions such as humidity, caffeine intake, etc.12 For these reasons, the US Food and Drug Administration (FDA) recommends two measurements per eye.13 The literature suggests this test may be the more accurate for dry eye diagnosis than Schirmers, TBUT and corneal/ conjunctival staining,14 although there is a cost for osmolarity testing, which is negligible for these other common tests. • No drops should be used prior to this test. The use of dyes can help assess the superficial ocular surface to detect damage that can be present in dry eye disease. These dyes include fluorescein, lissamine green and rose bengal. These evaluations are cheap and easy to perform clinically. All of the dyes are applied with the same technique as previously described for the TBUT test. Lissamine green and rose bengal evaluate the conjunctival surface by staining areas not properly covered by mucin. Rose bengal requires the use of anaesthetic when applied due to ocular irritation and epithelial toxicity. Lissamine green does not have this limitation and can additionally be helpful as it stains lid abnormalities such as Marx’s line and lid wiper epitheliopathy. There are three common grading systems that are used largely in clinical trials, including Collaborative Longitudinal Evaluation of Keratoconus,15 Oxford16 (see Figure 3) and van Bijsterveld.17 These grading systems can also be used clinically to aid in consistency. • All of the dyes are dose dependent. • The rose bengal dye staining is best observed with a red-free filter. • The cotton wisp test is easy and the cheapest method of corneal sensitivity. The CRCERT-Belmonte may be ideal due to its non-invasive and objective methodology but may not be clinically practical. • Consider this test when the signs and symptoms do not correlate. ectropion, blink evaluation and tear duct positioning and patency. All of these can have an effect on the tear dynamics and corneal wetting. The meibomian glands secrete a lipid called meibum that comprises the outer layer of the tear film. Dysfunction of these glands is the leading cause of evaporative dry eye, the most common type of dry eye. This dysfunction is most commonly caused by inflammation that can affect both their morphology and expression quality and quantity, all of which can be grossly examined at the slit lamp. Expression can be performed with the fingers, a cotton swab and custom-made devices. 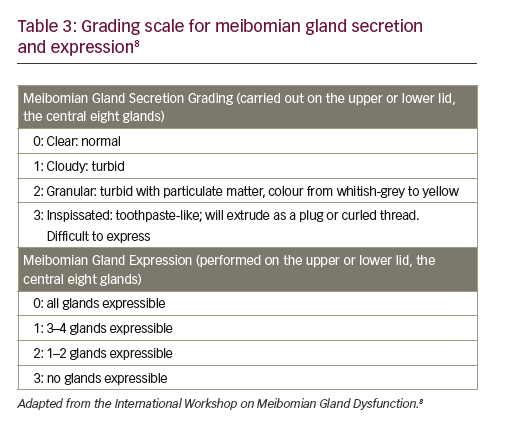 In 2011, the International Workshop on Meibomian Gland Dysfunction published a grading scale from 0 to 3 (see Table 3). Meibomian gland evaluation is easy to perform but has poor repeatability and is variable between practitioners.19 Other important lid margin characteristics to note are the presence of collarettes, lid notching and ridging, keratinisation, telangiectasias and chalazia. • Positive serum testing (anti-SS-A/Ro and/or anti-SS-B/La or rheumatoid factor and anti-nuclear antibody >1:320). • Salivary gland biopsy meeting specific diagnostic characteristics. The tear meniscus occurs at the intersection of the eyelid (typically evaluated inferior) and the bulbar conjunctiva. The most commonly measured parameter is the tear meniscus height (TMH). Abnormal values would be expected in aqueous deficient dry eye syndrome. Traditionally this measure was performed with a slit lamp, photography, video recording, a Tearscope or reflective meniscometry. More recently, the evaluation is carried out with anterior segment optical coherence tomography (OCT). With this device, if the height was less than 0.3 mm, the sensitivity was 67% and specificity was 81% for the diagnosis of dry eye according to a study conducted in Japan.23 No consensus has been made for the height cut-off level. Advantages of OCT to assess tear volume include its non-invasive nature, objective and quantitative measurements and additional measurements of meniscus curvature and cross-sectional area. The downside is that the OCT is an expensive instrument and measurements can be time consuming. • TMH should be performed before any drops are applied. Specific biomarkers for dry eye may be present in the tear film to aid in diagnosis. First, matrix metalloproteinases (MMPs) are enzymes that are found in high levels with ocular inflammation, which is a large contributor to the cause of dry eye disease. MMP-9, specifically, can be measured with InflammaDry (Rapid Pathogen Screening Inc., Sarasota, FL, US). A tear sample is retrieved from the lower cul-de-sac and results are given in 10 minutes (see Figure 4). For dry eye diagnosis, it has an 85% sensitivity and a 94% specificity.26 It does not distinguish the type of dry eye. This test is approved for use in Europe, Canada and the US and is easy to use. • Avoid punctal plugs in patients with high levels of ocular inflammation; consider first treating with topical anti-inflammatory agents. • No drops prior to performing test. • False positives can result from any cause of inflammation including infection, blepharitis and ocular allergies. Lysozyme is another protein that is reduced in dry eye disease but cannot be easily tested clinically. There are approximately 1,543 proteins in the normal tears but their relationship to dry eye, if present, is largely unknown.11 The clinically practical biomarkers to test at the current time are MMP-9 and lactoferrin, but this may change in the future. Corneal evaluation Confocal microscopy is a non-traditional method of examining the corneal cells in vivo. Studies have shown dry eye disease is correlated with changes in the epithelial and stromal layers, as well as the corneal nerves.27 This method is not commonly performed clinically to aid in diagnosis due to the availability of the machine. Another potential diagnostic corneal test includes infrared thermography. This test when applied to the eye offers an objective, non-invasive, quick measure of the temperature of the cornea. Compared with normal eyes, this temperature has been shown to be higher in dry eye patients. In addition, after sustained opening for 10 seconds, dry eye patients’ central corneal temperature becomes significantly lower where controls remain the same. Therefore, thermography can be used as a diagnostic tool. The Ocular Surface Thermographer (TOMEY Corporation, Nagoya, Japan) has recently been developed and takes measurements in a similar fashion to an autorefractor. A study by Kamao et al. showed that the decrease in the temperature after sustained opening was significantly related to TBUT (p<0.001) and the sensitivity and specificity for dry eye diagnosis were 0.83 and 0.80, respectively.28 There is limited research in the literature on this diagnostic method and the expense may be inhibitory.19 This testing is sensitive to the room temperature and humidity levels. Conjunctival evaluation The conjunctiva can be evaluated by surface biopsy, confocal microscopy and impression cytology to detect signs due to dry eye disease. None of these methods may be clinically practical. • Both of these devices are expensive but they also include features such as topography, tear meniscus and tear film evaluation. • Beckman et al.21 recommend all patients with aqueous deficient dry eye be considered for serological testing given the advances in testing and potential harm in a missed diagnosis. Conclusion Despite the challenges of dry eye diagnosis, numerous tests, some traditional and some emerging, are available and can produce useful data. 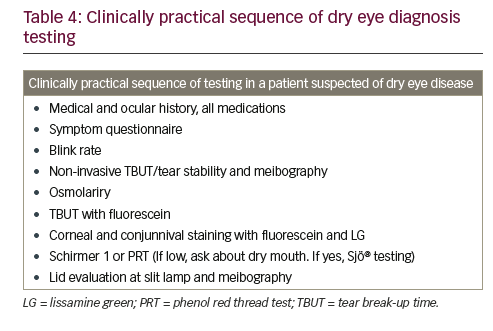 There is a logical sequence of tests for patients suspected of dry eye disease (see Table 4). Combining tests results, including signs and symptoms, will yield in the most accurate diagnosis. This article focused on the application of clinically useful tests, the benefits and limitations, as well as practical pearls to implement use. 1. The definition and classification of dry eye disease: report of the Definition and Classification Subcommittee of the International Dry Eye WorkShop (2007), Ocul Surf, 2007;5:75-92. 2. Savini G, Prabhawasat P, Kojima T, et al., The challenge of dry eye diagnosis, Clin Ophthalmol, 2008;2:31–55. 3. McGinnigle S, Naroo SA, Eperjesi F, Evaluation of dry eye, Surv Ophthalmol, 2012;57:293–316. 4. Methodologies to diagnose and monitor dry eye disease: report of the Diagnostic Methodology Subcommittee of the International Dry Eye WorkShop (2007), Ocul Surf, 2007;5:108–52. 5. Schiffman RM, Christianson MD, Jacobsen G, et al., Reliability and validity of the Ocular Surface Disease Index, Arch Ophthalmol, 2000;118:615¬–21. 6. Ngo W, Situ P, Keir N, et al., Psychometric properties and validation of the Standard Patient Evaluation of Eye Dryness questionnaire, Cornea, 2013;32:1204–10. 7. Tomlinson A, Bron AJ, Korb DR, et al., The international workshop on meibomian gland dysfunction: report of the diagnosis subcommittee, Invest Ophthalmol Vis Sci, 2011;52:2006–49. 8. American Academy of Ophthalmology Cornea/External Disease Panel. Preferred Practice Guidelines. Dry Eye Syndrome, 2013: San Francisco, CA. 9. Ousler GW, 3rd, Hagberg KW, Schindelar M, et al., The Ocular Protection Index, Cornea, 2008;27:509–13. 10. Szalai E, Berta A, Szekanecz Z, et al., Evaluation of tear osmolarity in non-Sjogren and Sjogren syndrome dry eye patients with the TearLab system, Cornea, 2012;31:867–71. 11. Foulks GN, Pflugfelder SC, New testing options for diagnosing and grading dry eye disease, Am J Ophthalmol, 2014;157:1122–9. 13. Lemp MA, Bron AJ, Baudouin C, et al., Tear osmolarity in the diagnosis and management of dry eye disease, Am J Ophthalmol, 2011;151:792–8 e1. 14. Bron AJ, Tomlinson A, Foulks G, et al., Rethinking dry eye disease: a perspective on clinical implications, Ocul Surf, 2014;12(Suppl. 2):S1–31. 15. Barr JT, Schechtman KB, Fink BA, et al., Corneal scarring in the Collaborative Longitudinal Evaluation of Keratoconus (CLEK) Study: baseline prevalence and repeatability of detection, Cornea, 1999;18:34–46. 16. 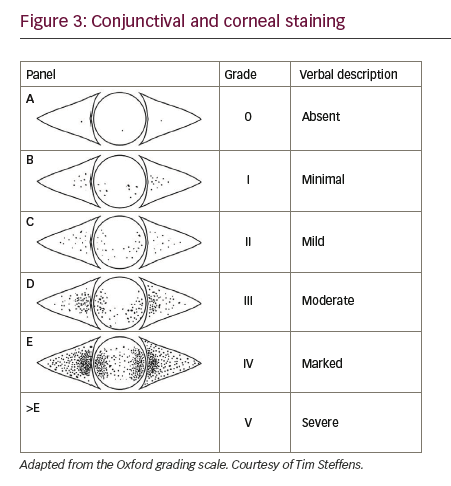 Bron AJ, Evans, VE, Smith JA, Grading of corneal and conjunctival staining in the context of other dry eye tests, Cornea, 2003;22:640-50. 17. van Bijsterveld O, Diagnostic tests in the sicca syndrome, Arch Ophthalmol, 1969;82:10–4. 18. Bourcier T, Acosta MC, Borderie V, et al., Decreased corneal sensitivity in patients with dry eye, Invest Ophthalmol Vis Sci, 2005;46:2341–5. 19. Zeev MS, Miller DD, Latkany R, Diagnosis of dry eye disease and emerging technologies, Clin Ophthalmol, 2014;8:581–90. 20. Downie LE, Keller PR, A Pragmatic Approach to Dry Eye Diagnosis: Evidence into Practice, Optom Vis Sci, 2015;92:1189–97. 21. Beckman KA, Luchs J, Milner MS, Making the diagnosis of Sjogren’s syndrome in patients with dry eye, Clin Ophthalmol, 2016;10:43–53. 22. Barabino S, Labetoulle M, Rolando M, Messmer EM, Understanding Symptoms and Quality of Life in Patients With Dry Eye Syndrome, Ocul Surf, 2016;14:365–76. 23. Ibrahim OM, Dogru M, Takano Y, et al., Application of visante optical coherence tomography tear meniscus height measurement in the diagnosis of dry eye disease, Ophthalmology, 2010;117:1923-9. 24. Hong J, Sun X, Wei A, et al., Assessment of tear film stability in dry eye with a newly developed keratograph, Cornea, 2013;32:716–21. 25. 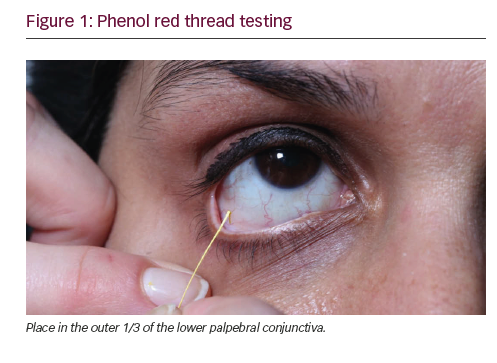 Kent C, Using Today’s Dry-Eye Diagnostic Tools, Review of Ophthalmology, 2015(October):22–35. 26. Sambursky R, Davitt WF 3rd, Latkany R, et al., Sensitivity and specificity of a point-of-care matrix metalloproteinase 9 immunoassay for diagnosing inflammation related to dry eye, JAMA Ophthalmol, 2013;131:24–8. 27. Alhatem A, Cavalcanti B, Hamrah P, In vivo confocal microscopy in dry eye disease and related conditions, Semin Ophthalmol, 2012;27:138–48. 28. Kamao T, Yamaguchi M, Kawasaki S, et al., Screening for dry eye with newly developed ocular surface thermographer, Am J Ophthalmol, 2011;151:782–91 e1. 29. Kanellopoulos AJ, Asimellis G, In pursuit of objective dry eye screening clinical techniques, Eye Vis (Lond), 2016;3:1. 30. Finis D, Ackermann P, Pischel N, et al., Evaluation of Meibomian Gland Dysfunction and Local Distribution of Meibomian Gland Atrophy by Non-contact Infrared Meibography, Curr Eye Res, 2015;40:982–9. 31. Akpek EK, Mathews P, Hahn S, et al., Ocular and systemic morbidity in a longitudinal cohort of Sjogren’s syndrome, Ophthalmology, 2015;122:56–61.